Learn how to use Hoopla and Kanopy from your device. Learn how to stream or download movies, tv shows, documentaries, foreign films, eBooks, audiobooks and comic books with Kanopy and Hoopla! Search for media and save to watch later. Checkout items and download or stream them. 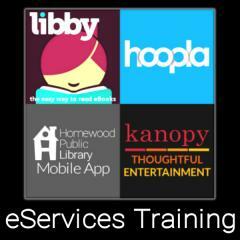 24/7 Entertainment is appropriate for all levels of experience with Homewood Library's apps. Bring your smartphone, tablet (Apple or Android), or laptop.